USDJPY is under the influence of Final Manufacturing PMI for JPY and the Loan Officer Survey, Construction Spending m/m and Final Manufacturing PMI for USD. After the Fed’s decision about the probability of postponing rates hike announcement, USD got weakened and led the USDJPY pair to a sharp fall. The support rests at 106.300 with resistance at 106.800 which both lines are below the weekly pivot point at 108.150. The MACD indicator is in negative territory showing the price decline and the RSI confirms this plot and is located below the 50 level. The ADX is showing strong sellers. The EMA of 10 is also forming a harsh drop as well and is moving below the EMA of 50 a well. 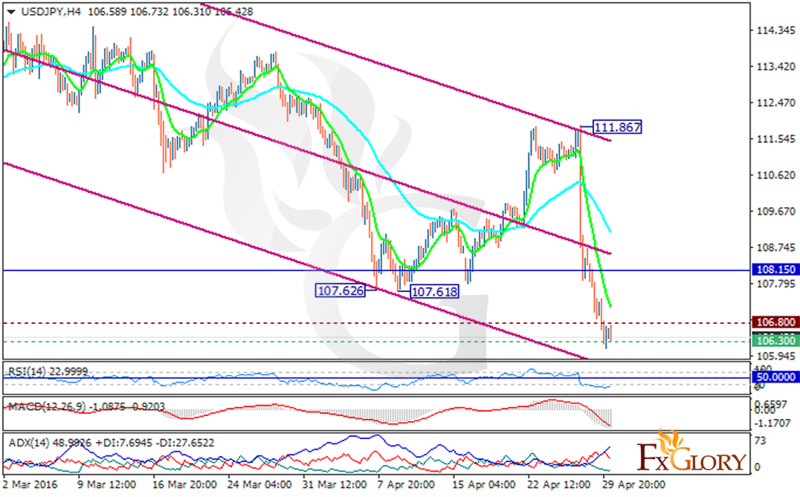 It seems that the pair will move in bearish bias to reach 105.80.